Pagoda Forest in the Shaolin Temple. Visitors can grasp Luoyang's over 3,000 years of heritage at the Luoyang Museum. Luoyang served as the capital of 13 Chinese dynasties and kingdoms. Hilton Yip lists some of the attractions of the ancient city. When you ask an expatriate to name the four ancient great capitals of China, most will list them in this order: Beijing, Xi'an, Nanjing and lastly, Luoyang in Henan province. Luoyang may lack the modernization and fame of the other capitals, but it boasts several famous sights, including Longmen Grottoes, a UNESCO World Heritage Site. It also has an impressive museum, housed in a new building, and the first Buddhist temple in China, the approximately 1,950-year-old White Horse Temple. With a history dating back to the 12th century BC, Luoyang served as the capital of 13 dynasties and kingdoms, including the Eastern Han Dynasty (AD 25-220) and the Kingdom of Wei, during the famed Three Kingdoms (AD 220-280) period. During the Tang Dynasty (AD 618-907), it was the Eastern Capital, second only to the imperial capital Xi'an. 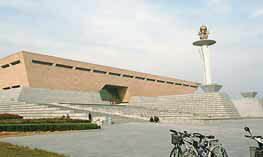 The first place to grasp Luoyang's 3,000 years plus heritage is at Luoyang Museum. Housed in a massive reddish-brown building perched grandly atop a gray foundation overlooking a park, the museum dominates its landscape. This is a new building, which the Luoyang Museum moved into in 2011, having been operating since 1958 at previous locations. In fact, it is so new that websites and even some Luoyang locals, whom I spoke to on a bus, still think the museum is at its previous location. The museum's spacious interior features an extensive collection of artifacts that date from the Xia Dynasty (c.21st century-16th century BC) to the Tang Dynasty. The famous Tangsancai, tri-colored glazed ceramic horses and camels of the Tang Dynasty are of course, on display prominently. For those who want to see truly ancient artifacts, there is a fully upright skeleton of an Asian mammoth (Palaeoloxodon naumanni), fossils from the Paleolithic age, prehistoric artifacts from 5,000 years ago, as well as ding (cauldrons) from the Xia Dynasty. 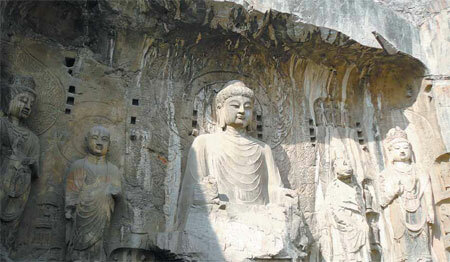 The main reason to visit Luoyang is Longmen Grottoes, one of the four most famous Buddhist grottoes in China. Here, past emperors ordered tens of thousands (no exaggeration) of Buddhist statues carved into caves in the cliffs along both sides of the Yihe River. The most impressive are the nine giant Buddhas that stand several stories high, with the highest at 17 meters, flanked by heavenly kings, temple guards and other divine figures. In contrast, some tiny Buddha carvings were smaller than the palm of my hand while others were human-sized. The fine craftsmanship and the massive numbers of carvings alongside the cliff walls made me think of Angkor Wat in Cambodia. The first statues were carved from AD 493 during the Northern Wei Dynasty (AD 386-534), but most were carved during the Tang Dynasty. It's not surprising that a number of statues have been disfigured, either by time or warfare. Don't make the mistake I did and assume that from photos and information gleaned from the Internet, Longmen Grottoes can easily be viewed in two hours. Longmen Grottoes is just 1 km and with most of the carvings concentrated on the northern side. But the sheer number of carvings and the fact that some of them are located higher up the hillside and require climbing up stairways, not to mention the temples on the southern side, mean visitors should allocate at least three hours to take in everything at a leisurely pace. 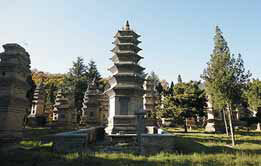 The southern side has far fewer carvings, but has many temples and steles, including the 1,500-year-old Xiangshan Temple. I was surprised on walking up Xiangshan Temple to see a much less ancient villa, which was where the former Kuomintang leader Chiang Kai-shek stayed to celebrate his 50th birthday in 1936. The rooms in the villa display photos of Chiang. This recent history pales in comparison to the surrounding statues and carvings, dating back 1,500 years. Near the exit on the south side is the grave of Tang Dynasty poet Bai Juyi, a former court official and governor of Henan. Other historical sites include White Horse Temple, located a little further to the north of Luoyang, and Guanyin Temple. There is also a royal horse and chariot museum, which features the remains of several sacrificial horse pits from the Eastern Zhou Dynasty (770-256 BC). Flower lovers would have heard about or visited Luoyang's Peony Festival and its many public gardens featuring the national flower. The more adventurous can go to the legendary Shaolin Temple, which is in Dengfeng, just over two hours away by bus. The most common route is to take a bus to Dengfeng, then a minibus to Shaolin Temple. The temple does not look like those typically seen in the movies. There are enough sights to take in, like Pagoda Forest, the actual temple, meditation caves, Songshan Mountain, and of course, performances by Shaolin monks. But the most impressive sight is seeing hundreds of youths practicing kung fu in the late afternoon in an open courtyard. Luoyang's old town is situated to the north, across Luohe River, which forms a boundary between the older and newer parts of the city. A formidable gate flanked by towers and a high wall serves as the entrance to the old town, where you can try the famous Shuixi water banquet dishes, which stem from the Sui Dynasty (AD 581-618). It is also a good place for an after-dinner stroll as the night atmosphere is particularly tranquil.